I’ve been running workshops supporting new (and aspiring) principal investigators/research leaders for about ten years. Over that time the content of the workshops has developed and as some topics fade from relevance, others become more important. The latest addition is resilience. There are two ways of looking at this – either that it’s a depressing indictment of academic life that we need explicity help to cope with the pressures, or a more positive view which is that it’s always been tough, but that the culture has shifted so it’s OK to talk about the pressure. Perhaps it’s one of the many wider benefits of the Athena Swan initiatives which are trying to create a more balanced and inclusive academic community. Whatever the driver behind the increasing willingness to talk about challenges and dealing with them, it means that over the last 2 years or so I’ve been covering the topic with academic groups. This post explains how we look at resilience, links to some of the resources we’ve found and shares insights from some of the academics who thought about their own resilience tactics. We use the analogy of a bucket during the workshops. Resilience comes from a combination of eliminating or reducing holes from the bucket, whilst keeping the bucket topped up. What puts the holes in your bucket? We start with a discussion about what drains away resilience and causes stress. Most people recognise their own triggers easily, but sometimes it’s useful to refer back to discussions about individual preferences that we have earlier in the research leader programmes we run, using the Myers-Briggs theory. 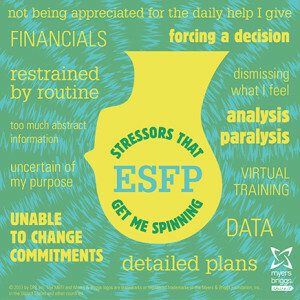 One of the resources that helps are the MBTI stress heads posters. If you don’t like MBTI it’s probably best to stay away from this site as it will make you cross (this is supposed to be a post about building resilience, not making people cross). Psychology Foundation of Canada – which has produced a short, but informative Workplace Resiliency guide. Once we’ve looked at the key features of the two models, we work in small groups to identify things that we already notice improve our resilience and what else we can do. It’s different for everyone, but these have come from academics and researchers during workshops. How would my mentor/someone more experienced handle this issue? The various models of resilience building have common themes. These seven are the ones that have resonated with me – you may have others. Having a good balance between work and life. By being able to relax and switch off from work; by being able to give time and energy to our families and friends, we are more likely to have focus at work because of being rested and less affected by guilt. Achieving our goals. If we can see that we are regularly achieving progress, we build a sense of being capable and in control. When we face a new challenge, we do it with a memory of success in other areas. Doing meaningful work. Working on something that we see as being important and in tune with our values helps us to be motivated by a wider purpose and to be committed to overcoming barriers. Having good support network. People are key to our success and happiness, as has been repeatedly stated in other chapters. Don’t be an island – develop strong relationships with people who can support, reassure and help you. Exercise and healthy eating. It is perhaps the greatest injustice in life that sitting on the sofa watching Poirot repeats and eating hob nobs will never be the key to a healthy existence. Regular exercise and eating well need to be part of your resilience strategy. Nothing else has the same impact on emotional and physical wellbeing, both now and in the future. Seeing the positive. Without being naïve, it’s important to see the best in our environment and colleagues. When faced with a difficult situation, you should believe that you can find a positive outcome and that people aren’t trying to take advantage or belittle you. Look for the positive and if it isn’t there, seek help. Getting feedback and reinforcement of achievement. Resilience grows when we can trust our judgement in difficult situations. This will be strengthened if we get feedback from others when we do well – make sure that you get an annual review and discuss successful outcomes to previous challenges with your line manager. Confidence can come from understanding your strengths rather than focusing on what you perceive are weaknesses. The Strengthsfinder book is a useful tool for identifying areas in which you are performing well as a basis for improving performance. With the book is a code to complete an online questionnaire which results in a comprehensive report and action planning suggestions. Resilience is often linked to a feeling of control which relates to time management. Our time management guide and our post on time management advice tailored for academics, may be useful if you feel over-committed or that you aren’t setting the right priorities.